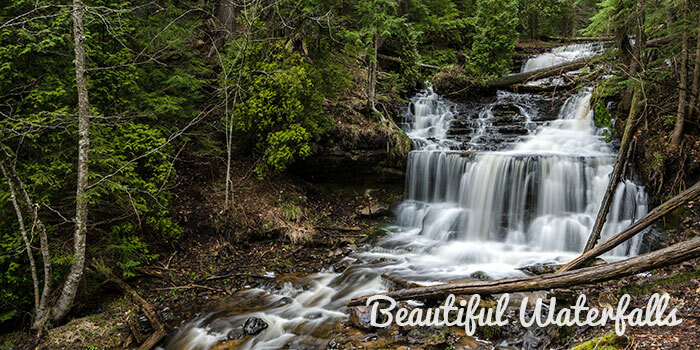 The waterfalls of Munising and the Grand Marais area are quite impressive to say the least. 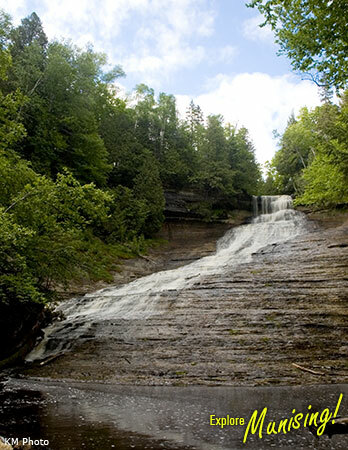 From roadside waterfalls to more adventurous day hikes, there’s something for everyone! The waterfalls below are the more popular ones as there many others that are unnamed, more difficult to find. During the winter months, some of the waterfalls will change into huge ice towers as the flowing water will freeze on its self. No matter which season you view them, just make sure to carry the necessary gear and be prepared for the conditions. 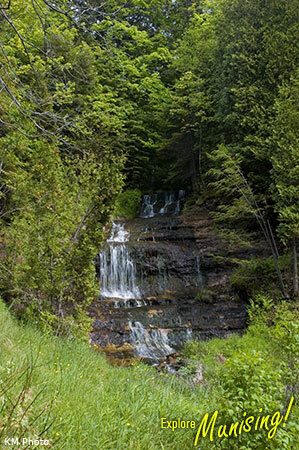 This roadside waterfall is at the M-28 and M-94 intersection east of Munising. 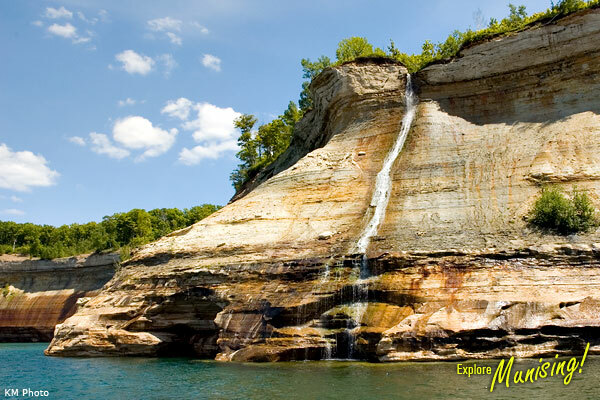 Located within Pictured Rocks National Lakeshore, Bridalveil Falls is best viewed from the water on Lake Superior. This is a seasonal waterfall that slows to a trickle during the summer months. Half mile east of Miners Castle on the Lake Superior shoreline. 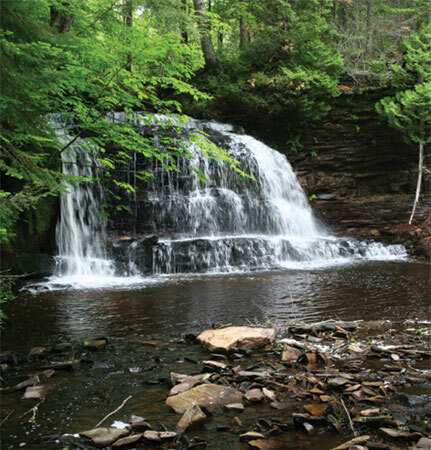 To reach Chapel Falls, take the marked walking trail 1.5 miles through beautiful forests and small hills until you reach the 60-foot falls. 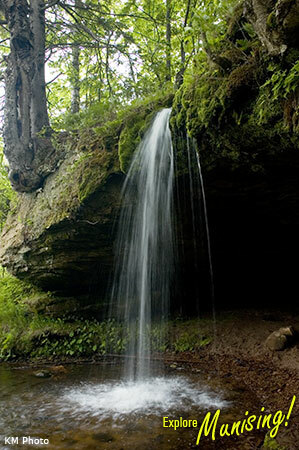 This trail also continues past the falls to the famous Chapel Rock on Lake Superior. No pets allowed. Drive 15 miles heading east of Munising on County Road H-58 until you reach Chapel Road. Head north for 5 miles until you reach the end of the road. Follow the trail heading north towards Lake Superior and waterfall is at end of beach. Follow H-58 east of Munising until you reach Miners Castle Rd. Drive 5 miles north until you reach a “Y” intersection and follow the road right. Turn right at next intersection and drive to end parking lot. 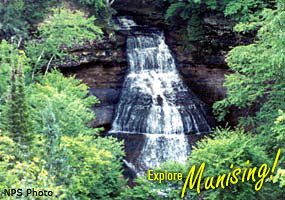 The Munising area features an impressive list of waterfalls and Horseshoe Falls & Gift Shop is one you should make sure to visit! 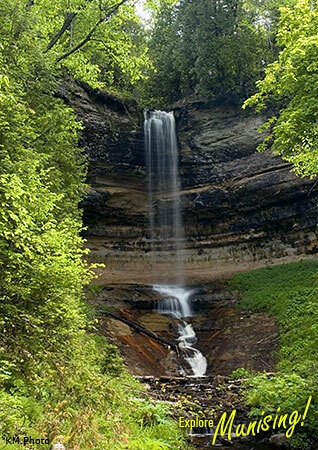 This beautiful waterfall is privately managed with the utmost care and has many unique features. Bring the family and spend the afternoon enjoying our beautiful gardens, picnic area, gift shop and the trout pond where you can feed the fish! 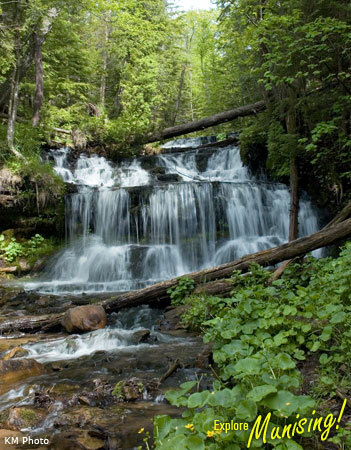 We also have trails for you to explore and take in the pristine beauty of the Upper Peninsula northwoods. We hope to see you soon! 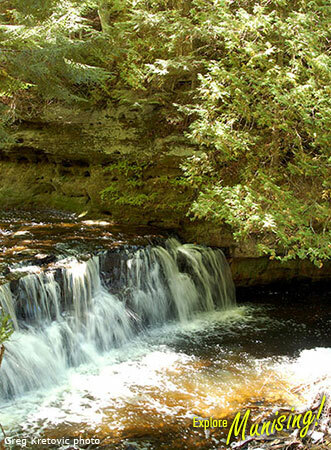 After a 20-minute hike, downhill, this beautiful 100 foot cascading waterfall flows into a deep limestone gorge. A winding wooden staircase, with viewing areas, will lead you to the bottom. This is a Michigan DNR collection site which requires a daily park pass or yearly vehicle state park pass. Follow M94 west of Munising, through Chatham, until you reach Sundell Road. Drive north until it turns gravel (seasonal mud) continue straight a 1/4 mile then turn right at the sign. Drive 1/4 mile to the parking lot. This unique waterfall drops 30 feet and the undercut rock walls allows visitors to walk behind the falls. The split trail also allows you to view from the top or from below. Since you approach this falls from the top, please use extreme care. North of Munising, follow H-58 until you reach Nestor Street. Turn right and drive about a block until you see the signs. 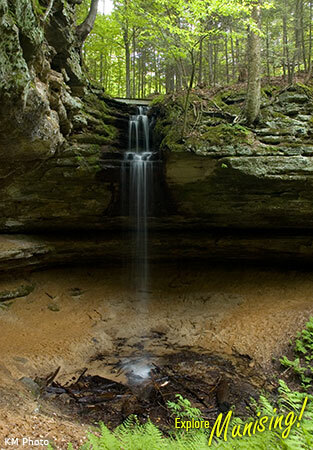 A 1.2 mile round-trip gravel walking path will lead you through a spectacular forest to where the Miners River drops about 50 feet into a sandstone canyon creating a spectacular view. There are two viewing platforms with the lower one having 77 steps to reach it. No pets allowed. Follow H-58 east of Munising until you reach Miners Castle Road. Drive 5 miles north until you reach a gravel road, turn right and follow 1 mile to parking area. 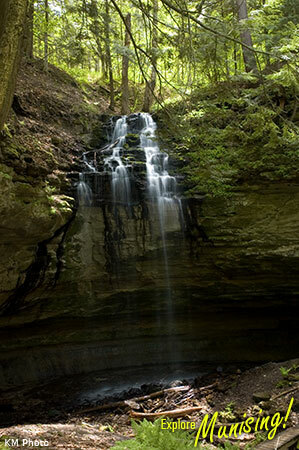 Follow a .9 mile hiking trail to the falls through forest and small hills to see this secluded waterfall. The Mosquito River flows over three drops with the largest being 8 feet. No pets allowed. 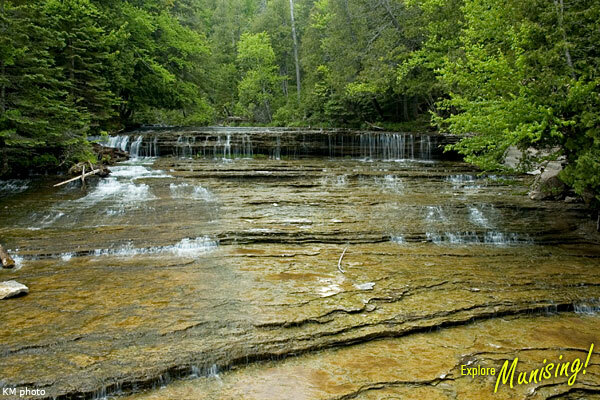 Located within Rock River Canyon Wilderness, this 20 foot cascading waterfall is within a secluded area of Alger County. 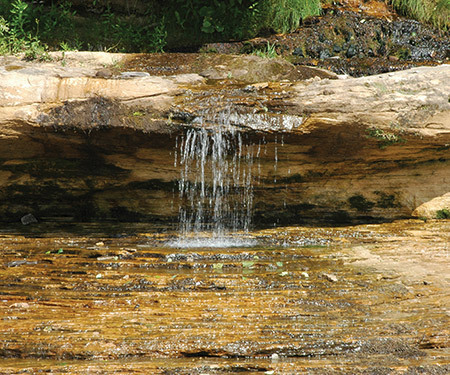 The falls is located 3/4 mile from the parking area and this waterfall is truly for the adventurous. No motorized vehicles, bicycles or wheeled devices allowed within the designated wilderness area. Drive west on M-94 until you reach the town of Chatham. Continue straight at the intersection on Rock River Road. Turn left on FR-2276 (Sandstrom Road) and travel about 3.5 miles. Then turn left on FR-2293. Parking area is .7 miles on the left side of the road. 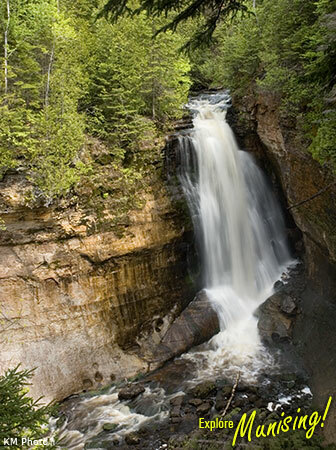 Following a short trail to the falls, this 75-foot waterfall tumbles over several cliffs until it reaches Lake Superior. The first viewing platform is down a staircase with 169 steps. Pets are not allowed on the trail. From Munising drive east on H-58 heading towards Grand Marais. 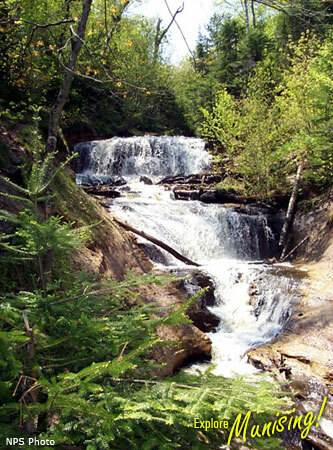 Sable Falls is 1 mile west of Grand Marais. This roadside waterfall is a straight drop of 10 feet and viewable from the road. Drive 10 miles west on M-28 from Munising until you the roadside park on Lake Superior. The falls is slightly hidden on the south side of the road. 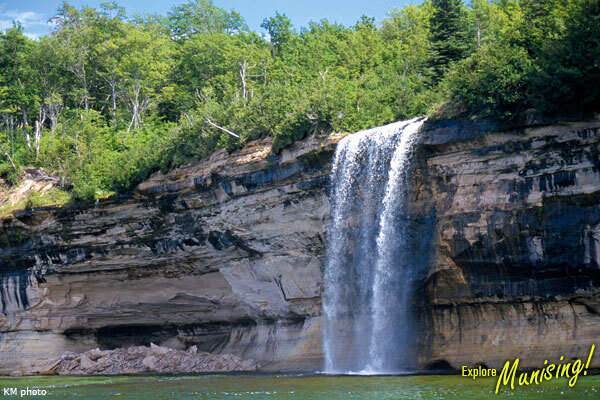 Spray Falls drops approximately 70 feet to Lake Superior and creates a spectacular view. Although best viewed from the water, it can also be seen on the North Country Trail. This hidden gem drops approximately 40 feet but it is not well marked or advertised. This waterfall is also known as Rudy M. Olson Memorial. 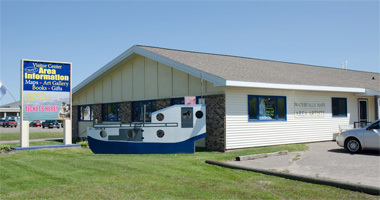 Drive east on H-58 out of Munising until you reach the Washington Street (also known as Sand Point Road) intersection. There is a staircase leading into the woods on the eastside of the highway. Please make sure to park on Washington Street as you will be ticketed for parking on the highway. 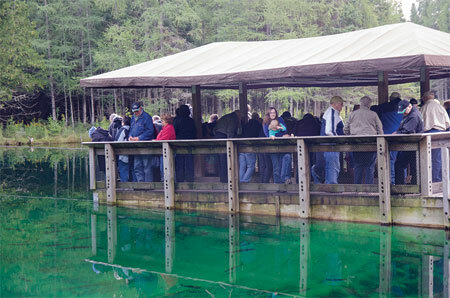 Short walking trail leads to natural spring pond that features a self-operated observation raft. Drive east on M28 to Shingleton and then south on M94 to Manistique and US2. Travel west on US2 to Thompson and then north on M149 for 15 minutes.